On January 6, 1941, President Franklin Delano Roosevelt appeared before Congress and offered his State of the Union Speech, which in years to come would be known as the “Four Freedoms” address. His personal mission was clear. President Roosevelt understood that the United States’ involvement in World War II was inevitable. Although we still remained on the sidelines that January, he endeavored to ready the country for war. His speech concluded with four universal truths. All human beings are entitled to these essential freedoms: freedom of speech, freedom of religion, freedom from want, and freedom from fear. The first two, of course, were familiar phrases to all Americans and protected rights as described in the Constitution of the United States. The last two freedoms, however, purposely transcended U.S. doctrine. They described intrinsic rights due to all men and women everywhere. Of course, his speech was met with much debate and some resistance. Why join a war being fought an ocean away? Then came December 7 and the attack on Pearl Harbor. Meanwhile, in the small New England town of Arlington, Vermont, the country’s most popular magazine illustrator of the day, Norman Rockwell, listened to Mr. Roosevelt’s State of the Union address on the radio. Several months later, he read a proclamation, named The Atlantic Charter, co-written by Winston Churchill and Roosevelt. In it, the two great leaders of the Western world endeavored to explain the four basic freedoms entitled to every human being on earth. That December, the United States entered World War II. As he described in his autobiography, Norman was too old to enlist and his three sons were much too young. Still, he watched his neighbors’ boys march off to war. 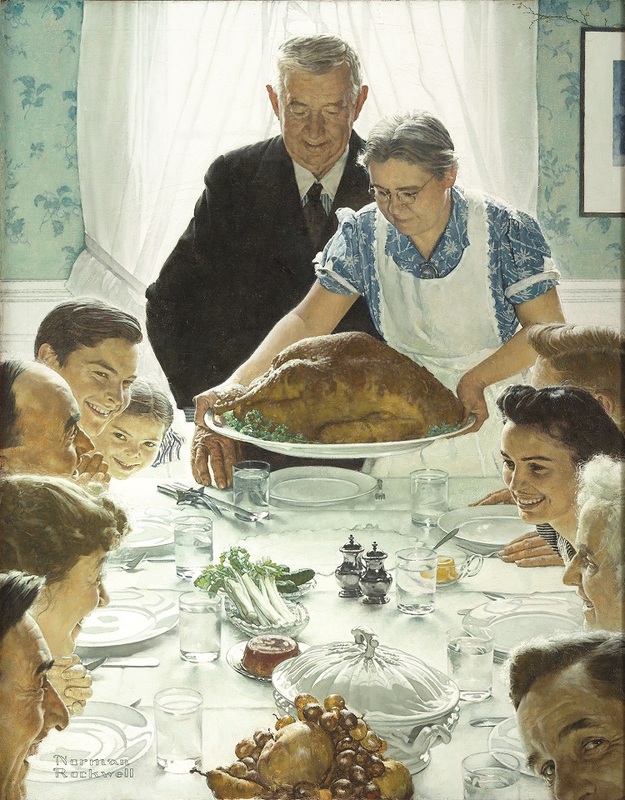 Norman Rockwell, like every American, wanted to do his part. He read and re-read The Atlantic Charter. He wanted to show on canvas what those four freedoms meant, and why Americans felt compelled to send their brave, young men and women into harm’s way. However, the words were so eloquent that the artist struggled for weeks, suffering sleepless nights, trying to find the right visual concept. Then, one evening, he attended an Arlington town meeting. His friend and neighbor, a local “no nonsense” farmer, stood up and spoke. As the artist explained it, “No one agreed with Jim; everyone wanted him to sit down. 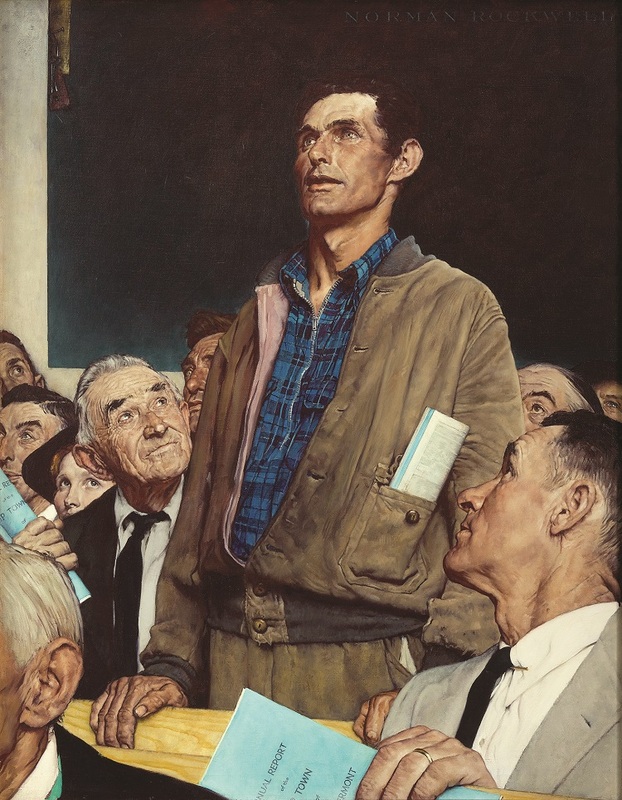 But, we knew Jim was entitled to have his say.” At that very moment, Rockwell realized he was watching freedom of speech in “real time.” Suddenly, he knew what to do: he would paint everyday scenes that people easily recognized and ask his Vermont neighbors to be his models. Rockwell left the nation’s capital thoroughly dejected. After all, not only did they not like his idea, but the Washington bureaucrats didn’t even consider him a real artist. When Norman shared the humiliating episode with his editor at The Saturday Evening Post, Ben Hibbs immediately realized the idea’s brilliant potential. 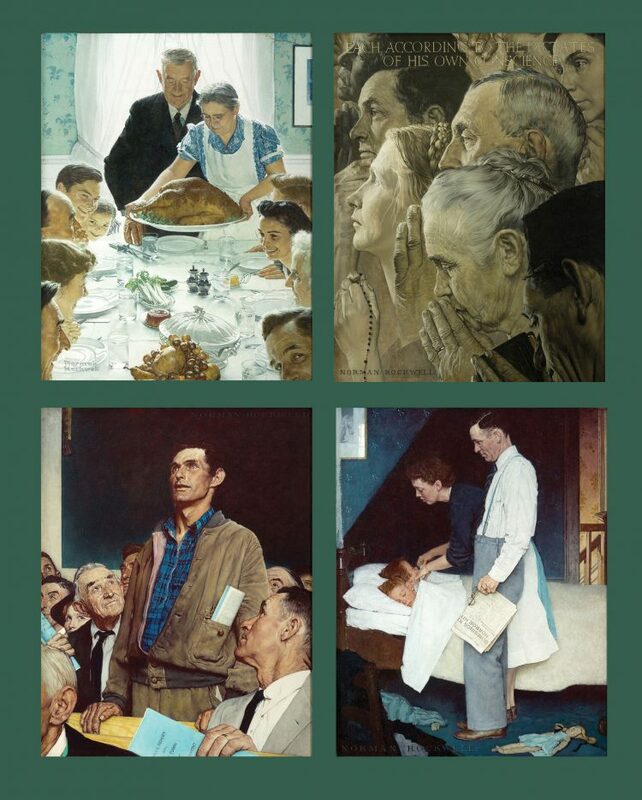 On the spot, he commissioned Norman to create the Four Freedoms, not as Post covers, but as features inside the magazine. Each representation of freedom would accompany an essay about why it was worth the fight. In 1943, The Saturday Evening Post published the depictions. Four distinguished writers of the day (Stephen Vincent Benet, Booth Tarkington, Will Durant, and Carlos Buloson) all composed essays. The public went wild! The images were hailed around the nation (and the globe) at a time when the war was going against the Allied Troops. It just so happens that at the same time, the U.S. Treasury was broke! Well aware of the public’s admiration for these four images, The Treasury Department asked the artist to tour the country with his original Four Freedoms paintings to sell war bonds. Those paintings, that no one in Washington originally wanted, raised almost $133,000,000 (the equivalent of $1.7 billion today). And it was that infusion of funds (at such a critical moment) that changed the course of events and helped the United States win the war. 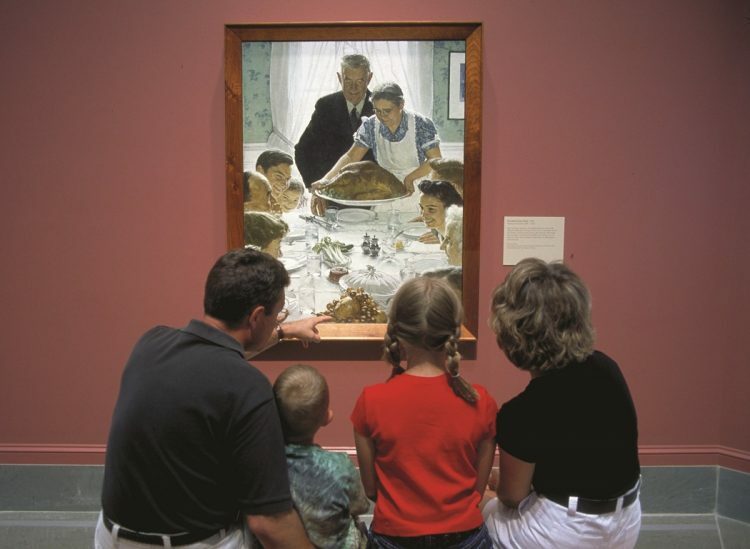 Norman Rockwell painted the Four Freedoms while living in the house above in Arlington, Vermont. 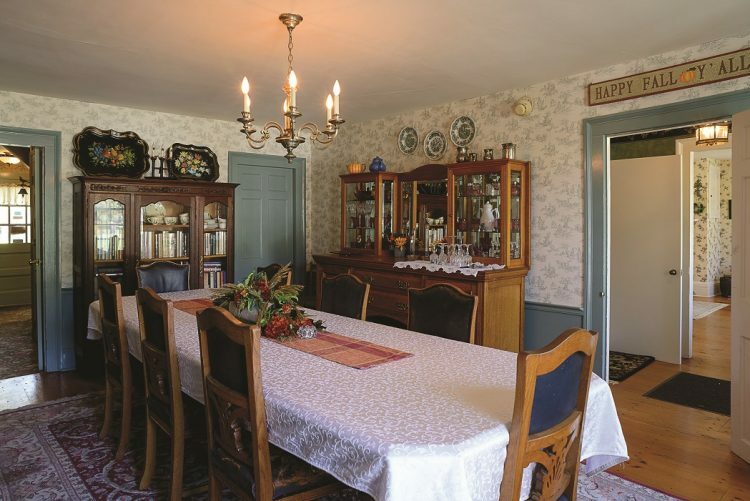 The dining room remains remarkably similar to when Rockwell painted Freedom from Want in 1943. The home and his studio today are the charming The Inn On Covered Bridge Green. 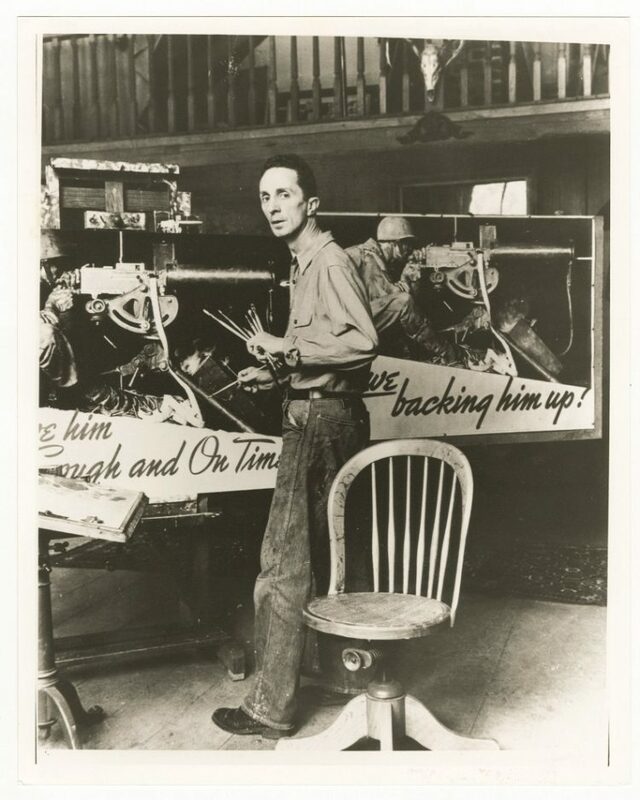 Gene Pelham (1909–2004), photograph of Norman Rockwell with his painting Let’s Give Him Enough and On Time in his Arlington, Vermont studio, 1942. Collection of Norman Rockwell Museum. ©Norman Rockwell Family Agency. All rights reserved. Vermont historical marker at Norman Rockwell’s former house, now The Inn On The Covered Bridge Green. 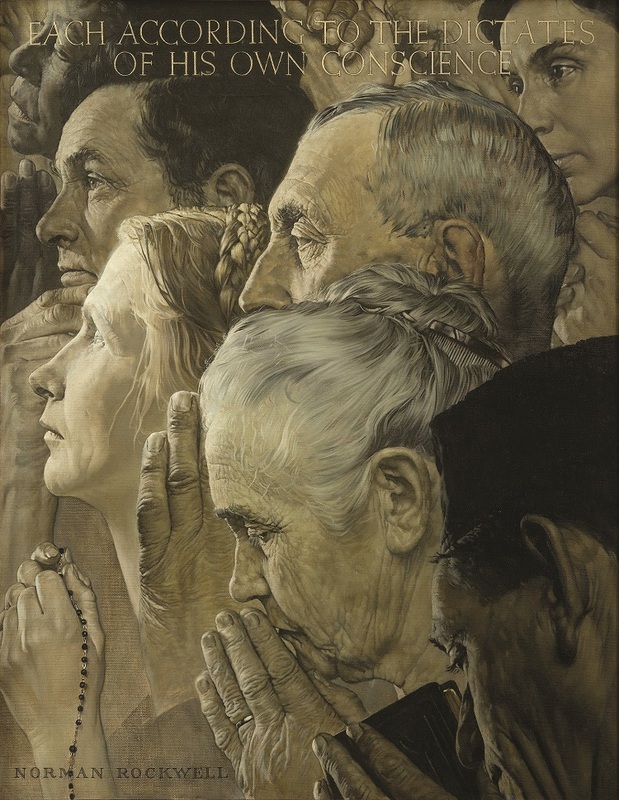 Organized by Norman Rockwell Museum in Stockbridge, MA, Enduring Ideals: Rockwell, Roosevelt & The Four Freedoms is the first comprehensive traveling exhibition devoted to Norman Rockwell’s iconic depictions of Frank Delano Roosevelt’s Four Freedoms. 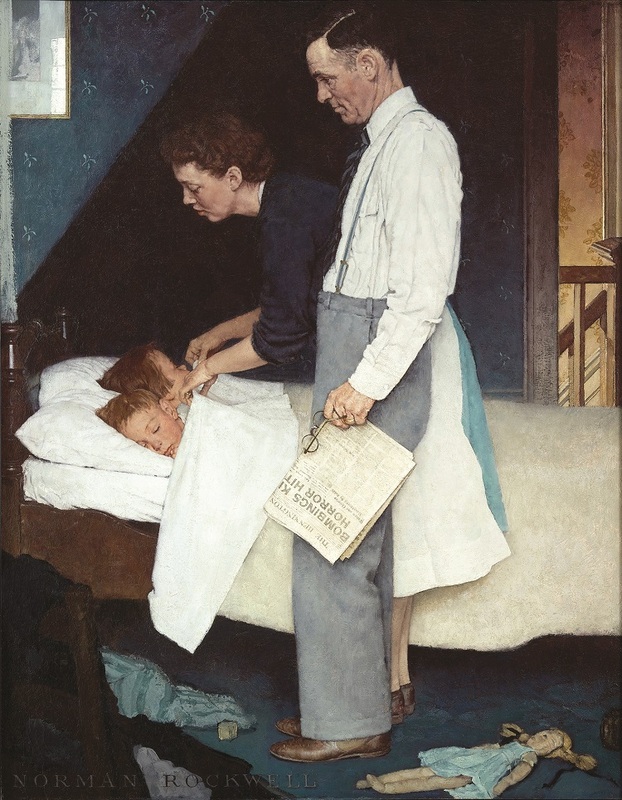 It illuminates both the historic context in which FDR articulate the Four Freedoms and the role Rockwell’s paintings in bringing them to life for millions of people, rallying the public behind the War effort and changing the tenor of the times. In telling the story of how Rockwell’s works were transformed from a series of paintings into a national movement, the exhibition also demonstrates the power of illustration to communicate ideas and inspire change. For more information, visit www.nrm.org. The “Four Freedoms” gallery at Norman Rockwell Museum. Photo courtesy of Berkshire Visitors Bureau. 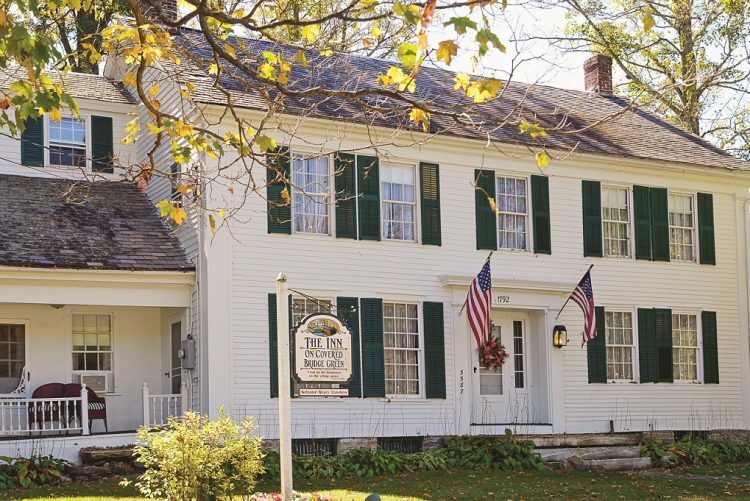 In July 2018, Vermonters take the lead once more to honor the Four Freedoms when THE MILL, Inc. (located in East Arlington and founded by Vermont resident Dr. Joshua Sherman) will host its inaugural 4 Freedoms Festival℠. How appropriate that the very place that inspired Rockwell’s four iconic paintings should now give birth to a creative movement that unites the generations through the arts and humanities. In that spirit, the 4 Freedoms Festival℠ will offer lively discussions with distinguished artists, literary figures, government officials, and other popular personalities, as well as highlight and honor Vermont’s youth for their own artistic and poetic interpretations of freedom. 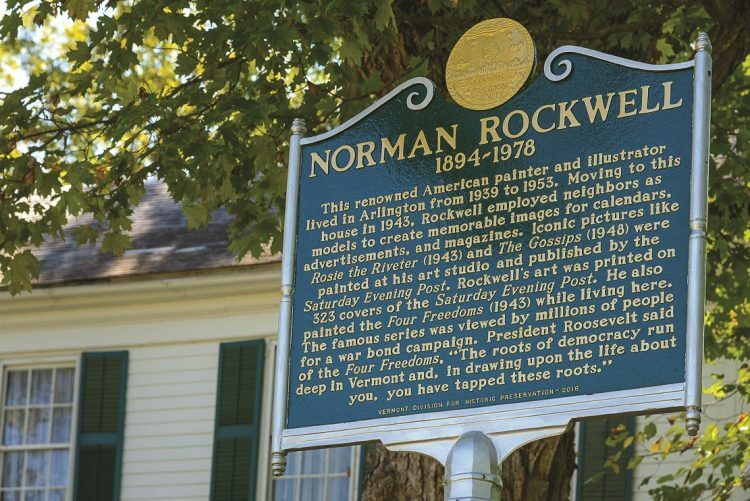 From concerts to contests, to outdoor events that include a ride and walk 4 freedom, and even a musical about Rockwell, himself, Southern Vermont will erupt with the sounds, sights, and significance of the Four Freedoms. Grant them all freedom from fear. The world is theirs to make. for generations plant a seed. Stand up proud and speak out. Let them know what you’re about. the things we call absurd. when people put it to the test. It takes guts to be free and defend sweet liberty. Evil thrived when men were weak. and then, the worst occurred. Sweet dreams, hot meals, and all a home brings. We can’t relent if they be ours to keep. Freedom from want does not come cheap! Raise your voice; Sing with ease. We’re free to worship as we please. Life presents us all with storms. and helps us find the way. In difference we unite to secure this sacred right. to claim these freedoms we hold so dear. and guide us through the darkest night. The spark of freedom still burns bright! means sacrifice from young and old. 4 freedoms call; 4 freedoms call. THE MILL, Inc., a 501(c)(3) not-for-profit organization, is founded on the beliefs that connectivity, creativity, innovation, mentoring, and collaboration among individuals and organizations lead to extraordinary achievements. Built as a gristmill, the building’s original purpose (in 1764) was to refine wheat into course grain (grist) and then into flour. THE MILL’s newest purpose is to encourage youth to refine their skills while established artists feel free to re-define their message. For more information email: [email protected].